Updated: Google Maps is back on iOS with a vengeance. The G-team has released a native app for iDevices with all there is to love about Google Maps, including turn-by-turn navigation, live traffic info, transit data and Street View. Folks have been clamoring for Maps (according Google), and the app is rolling out globally through the App Store. It's optimized for iPhone 5 and needs iOS 5.1 or higher to run. The sheer volume of navigationally challenged people trying to get Google's Maps is reportedly causing download issues, but those should ease up once the excitement settles. Google Maps will make its hoped for return to iOS Wednesday night, according to a new report. Sources speaking with AllThingsD said the popular navigation tool made by Google will release for the iDevice set soon. The app should be welcome news to those users fed up with Apple's own lame maps outing, one that has left users lost, without public transportation info and even in danger. There's still no details as to when exactly the launch will happen, though it sounds like users should see the app within the next few hours. Apple was harangued after it, for the first time ever, jettisoned Google Maps in iOS 6, favoring its own native Maps application instead. 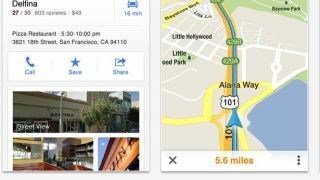 Google Maps reportedly got the boot after Google's refusal to offer turn-by-turn navigation, plus a few other features, found in Android and other systems. Apple CEO Tim Cook was forced to make a public apology shortly after Maps' deficiencies became glaring and embarrassing. Rumors swirled that Apple hired ex-Google mapmakers and Apple Store employees were tasked with correcting inaccurate data, all in the hopes of getting Cupertino's Maps to the level expected of it. A Google Maps app for iOS, if and when it arrives, will no doubt be gobbled up by eager Apple users. TechRadar asked Google and Apple for comment, and will update this story when we hear back.